With the season upcoming I thought it would be a good idea to follow up our off-season hockey training mistakes blog post with a post about the consistent in-season training mistakes that hockey players are making. You don’t want to be one of the hockey players who trains hard in the off-season only to lose it all during the season. Consistent, intelligent programming should be in place to ensure you perform to your optimal ability on the ice, while at the same time don’t lose what you gained during the off-season. I mean really, that’s what the off-season is all about. Getting stronger, getting faster, and getting better. Losing this all half way through the season due to poor programming seems like a real defeating strategy, especially when you consider that playoffs come at the end of the season, this is when you should be at your physical peak (and not at your worst!). Without further ado, let’s dive in to the top 3 training mistakes I see among athletes and coaches in their in-season hockey strength and conditioning. Although these are being numbered in no particular order, I still wanted to discuss fatigue management first as it is crucial here. Well, it’s honestly crucial year round — but this is especially so during the season because during the season performance is our #1 priority. Performance is the most important indicator that your in-season training is going to plan and the measurement of this indicator largely involves fatigue management. If you’re not recovering, you’re not going to play well. There’s no way around that. #2: During the off-season we are training the characteristics that we cannot train during the season due to their effect on the body; such as heavy strength and hypertrophy work. The wear and tear on your body during the season cannot cope with the wear and tear that high volume heavy strength and hypertrophy work brings. Recovery will not be adequate and as a result performance will suffer. #3: During the off-season, we are working towards greater performance whereas during the in-season we are allowing that performance to peak and come to life. The problem I see with fatigue management with some hockey players is they simply don’t address it at all, or have no way in which to measure it. This is something that has to be addressed because if it isn’t you don’t know if you need to back off your training a bit, or if you could even increase your training volume a bit. You are completely in the dark — and you need some light to make sure you are measuring where your fatigue status is. – Poor nutrition: A crappy diet is an easy way to not recover and not make progress. But, it doesn’t necessarily have an acute effect on fatigue. Meaning, if you generally eat well all the time and have one bad day, odds are your performance and recovery won’t actually suffer the next day (provided you get on track sooner than later). But if your nutrition stays bad, then this will be a leading indicator to the onset of fatigue. – Sleep: Same thing goes for sleep. If you generally sleep well at night and then you have one bad night’s sleep. That’s not going to kick off enough fatigue to require adjusting training volume or calorie intake. It also probably won’t even meaningfully effect your performance the next day. But if this is something that happens several times weekly, you will be running into fatigue and you will be running into it soon. All in all, it’s quite easily definable but not very accurately measurable. Sure it’s a leading indicator but I’d also take your results with a grain of salt. Some weeks you’re on and some weeks you’re not. There are times when there is a weight on the bar that you have squatted no problem before feels heavier this week. How heavy it felt and what speed you moved the bar at both play into concurrent fatigue factors. If it feels heavier than before, odds are highly stacked in the favor of you not being fully recovered. – Reps / Capability: This is a very easy and unavoidable parameter to catch. Simply put, are you working to your potential in the gym? As an easy example, if you did 5 x 5 at 405lbs in the squat last week, and this week you could only squeak out sets of 4, this is a problem. Very clear concurrent indicator that you are digging a hole of fatigue. The way in which this indicator separates itself from bar speed / bar weight is in that some cases even though the bar feels heavier than normal and moves slower than normal, you still get all your reps. But in this case, you did not reach your potential and fell short of the target. Where the vertical jump separates itself from grip strength is that the jump is mainly a measure of power and power has a faster decay rate than strength and therefore it is a greater leading indicator as opposed to concurrent indicator. Power is going to go before strength in the fatigue continuum. How the grip strength test works is you are tested on your morning grip strength at certain intervals and if this grip strength begins to consistently drop fatigue has set in. 3. Lagging indicators: These are parameters which you can use to see if fatigue has already set in and you did not catch it in time. At this point, deloading and/or light days are a necessity until you recover. Ideally, we wouldn’t be here at all and you would have already changed things around at this point. Heart Rate Variability (HRV): HRV has very good data supporting the fact that you are fatigued but that’s exactly it, you’re already fatigued. If you were paying close attention to the concurrent and leading indicators of fatigue management you need not HRV because at this point odds are that it’s too late. This is a deeper zone of fatigue when compared to the concurrent variables. Now if you’re a coach and you are managing a hundred clients at a time and you need reliable data on their fatigue management, this can be a great way to go; but I do believe they should go hand-in-hand with the concurrent and leading variables in that you teach your athletes what to look for and/or have them fill out a weekly fatigue questionnaire that includes both the concurrent and leading variables so that you can stay on top of it ahead of time. Actual performance: Last but not least, your performance on the ice! This is a no-brainer but must be included for completeness of the indicators. Simply put, if you’re unmotivated to go play a game or go to practice, or if you’re exhausted during/after games and your performance is suffering, you’re fatigued. Keep in mind this isn’t just physical either. If you have mental fog, memory problems, a lack of focus, and a lack of just overall motivation — these are all great signs of fatigue accumulation. Keeping track of these important indicators and checking out my other two blog posts on fatigue and recovery management will pay huge dividends to your performance during the season. Fatigue can accumulate very quickly when you’re playing games, travelling, practicing and trying to train at the same time… which is why it is so important to have measurable, reliable markers. Here’s a topic I really don’t think gets enough justice in the hockey strength and conditioning world, and it’s one of the most important concepts to get a full grip on when you’re training athletes. You need to know how to structure training phases in a coordinated manner in order to get a desired result. Hockey players need to train certain qualities at certain times of the year in order to maximize their potential. This means, properly coordinating speed, power, strength, hypertrophy, aerobic endurance, anaerobic endurance, and sport specific work so that they complement each other and potentiate the future training phases for continued progress. When these qualities are trained at random with no consideration of the in-season or off-season training cycles, you are just guessing. At the end of the day, a training method is only as effective as its application. Training methods must be used at the right time, in the right place, in the right way. If this is not in line, even the best methods can yield mediocre results. In addition to this, peaking doesn’t begin and end once the in-season starts. A lot of athletes, and in most cases strength and conditioning coaches as well, will put all their eggs into the basket of peaking their athletes for tryouts or hockey camps come late August. Which is totally fine, I get that. The problem is once that is complete they throw the idea of peaking out the window until next year. Let me ask you something. When do you need to be playing your absolute best? At the beginning of the season, or during playoffs? Many of you reading this probably just nodded your head in agreement with the playoffs statement. I mean, who wouldn’t? This is another reason why periodization is so important. The in-season isn’t just about maintenance of everything, it’s also about peaking your team for top performance once the games that matter the most come around (playoffs!). Peaking comes twice, not once, and only proper periodization and controlled tapering can do this properly without letting your fitness characteristics decay due to a decrease in-season training volume. A tip for anybody reading this who is determined to design their own periodization, choose where in the year you want to be performing your best and work backwards incorporating your training cycles from there. I was deciding whether or not this was just going to be a part of the periodization mistake as your periodization determines what type of training you do and when, but it’s enough of an issue all by itself for discussion. Training for hockey can be tough, right? Hockey players are involved in a team sport that is mixed energy system demand dependent. Meaning, you need so many different qualities in order to be successful, and that’s in addition to your natural athletic ability and genetics. Hockey players need to be strong, powerful, stable, coordinated, have well developed aerobic and anaerobic endurance capacities, be able to read the game play, and have both fast acceleration and top speed on the ice. These are all different trainable qualities that result in different intracellular signalling outcomes in the body — so when it comes down to a guy like me creating a properly structured system for optimal performance, you can see how complicated it can get in comparison to a more dominant energy system demand sport such as triathlons where developing a massive aerobic base is most of your battle. Each of those training stimuli a hockey player trains has to recover and adapt properly without interference of other stimulus adaptations. This is known as “Conflicting adaptations”. Jumping in and training all of those qualities at the same time will result in you being a jack of all trades, master of none. “Do you want me to be strong? Do you want me to have good endurance? Do you want me to be explosive? This is where (once again) proper periodization and phase potentiation comes into play. If you focus on one quality with a greater emphasis for a certain period of time you will make more gains in that quality. For example, if you just trained strength for the next 4 weeks — you will become stronger than if you were to try and train strength plus all those other qualities at the same time. This is because your body is saying “Ok, this guy clearly wants me to be stronger so I’m going to get stronger”. This is also known in sports science as the directed adaptation principle. This is what phase potentiation is all about. Choosing a quality to maximally adapt to in a given training phase. Where periodization comes into play is incorporating the correct strategies in order to hold on to that adaptation while you get better at another quality. For example, speed + power have the quickest fitness decay rates of any quality. They begin to decrease in an athlete only 2 weeks after not training in this manner. This is a highly sensitive quality and should be treated as such. • Keeping some power movements either in your resistance training or conditioning throughout the next phase. • Keeping an intensity level over 75% 1RM for your more major lifts has been shown to delay this decay rate. • Unless you are moving at 90% max velocity, you’re not training power anymore. So when doing power in this phase ensure you are truly training power. Knowing the science behind this specific decay rate allows us to focus on another quality while simultaneously holding on to a different quality. Progress without regress. In another example, aerobic endurance adaptations have been shown to have a residual effect lasting upwards to 30 days. Meaning, once you have acquired the aerobic base and/or aerobic adaptation you were looking for, you need only revisit it every so often in order to maintain it. Trying to do everything at the same time will result in you spinning your tires in the mud, getting nowhere really fast. But proper phase potentiation and understanding decay rates allows us to make better gains over the course of a given year of training. Not that important for the general public looking for standard health benefits… but extremely important for hockey athletes looking to improve performance. It really comes down to proper cell signalling within the body. AMPk (endurance adaptation intramuscular stimulation) will shut down mTOR (strength/power adaptation intramuscular stimulation) so the two cannot be maximally trained simultaneously. They can only be adequately trained simultaneously, but “adequate” and I don’t really go well together. Everybody reading my blog knows I only want to give the absolute best information available that will propel you to the next level in their performance. Adequate won’t cut it, so, periodization it is. 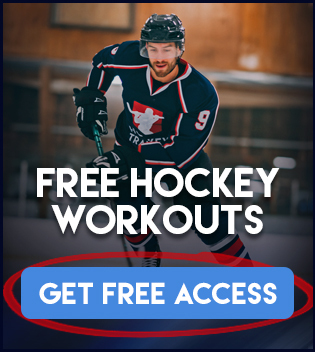 If you aren’t currently following a professionally designed hockey workout check out our Hockey Training Programs page to learn more about what we offer to help you get better on the ice.